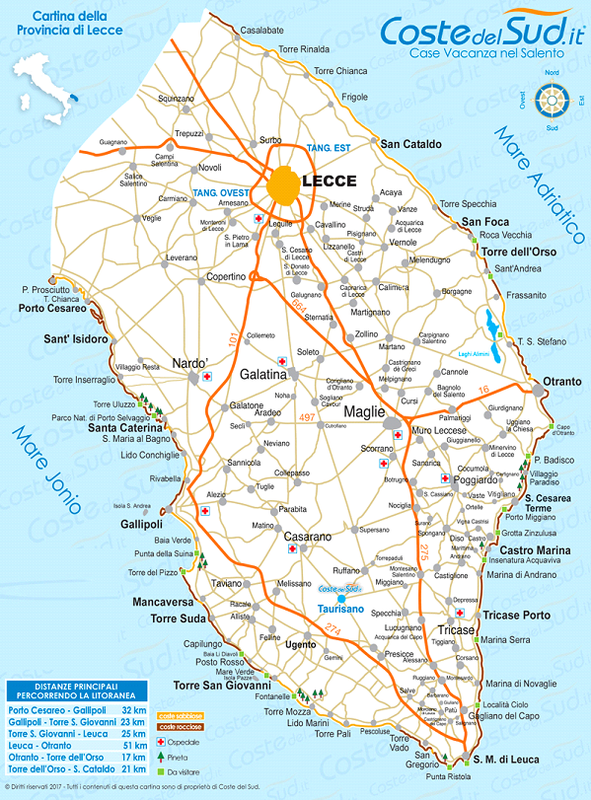 Starting from Lecce, you can easily reach San Cataldo, the main marina of the city, which is only a few kilometers away. 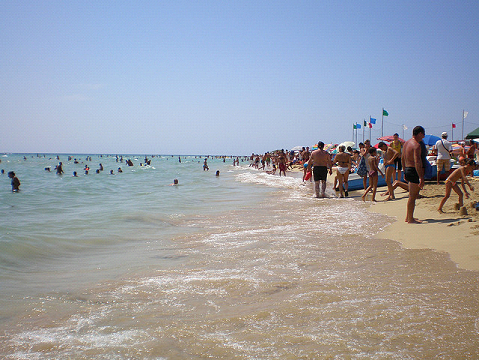 San Cataldo is the beach of Lecce, when they want to take a quick swim at the beach without going too far. It offers a long coastal stretch, of which the best is occupied by private beaches. It does not offer much for fun, but in the evening you can decide to take a walk along the promenade or stop in a small square where you will find pizzerias and ice cream parlors. Of particular historical interest is the Port of Hadrian, remnants of the ancient Roman port well visible near the lighthouse, currently being recovered. The “faraglioni” in Torre Sant’Andrea. 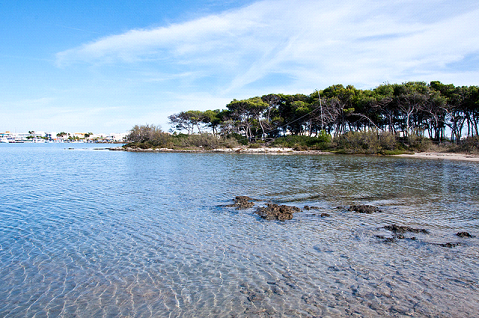 Continuing south, you will reach the centers of San Foca, Roca Vecchia and Torre dell’Orso. San Foca also offers a walk along the sea and beaches this time wider, although the sea is more exposed to the winds and therefore more often moved. In addition to the ice cream shops on the seafront, there are good pizzerias in the streets and in the evening it is ideal to stop in one of the shores just outside the town that become excellent open-air discos. Roca Vecchia, on the other hand, is especially important for its historical and archaeological contribution to the Salento area. Here, in fact, were found a series of human settlements of various ages, from the Bronze Age to the Middle Ages, and it is possible to visit the archaeological area with some medieval and even more ancient remains of the Messapian period. 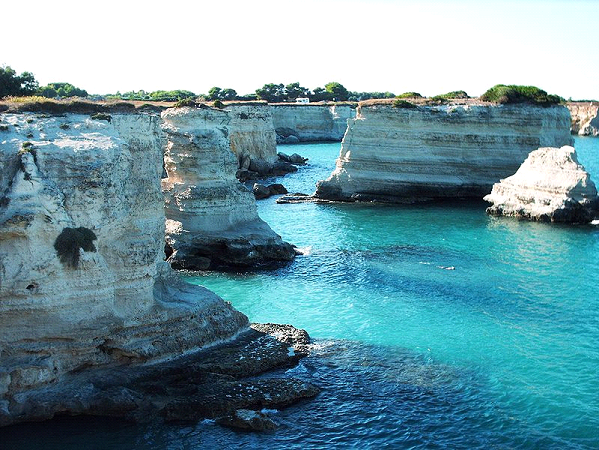 Torre dell’Orso is vice versa, a more youthful destination, with a half-kilometer long coastline protected by high rocks. The boys storm these beaches dividing between those who prefer private shores (renowned “The Orsetta”) and others that are spread in the vast, but crowded, free beaches. For the evening, the walk is inevitable on the promenade and in the innermost green area of ​​the Giardini del Sole, where you will also find pizzerias, ice cream parlors and a series of stalls. Delicious hot croissants that you can find at Pasticceria Dentoni, in the new location a few steps from the beach. 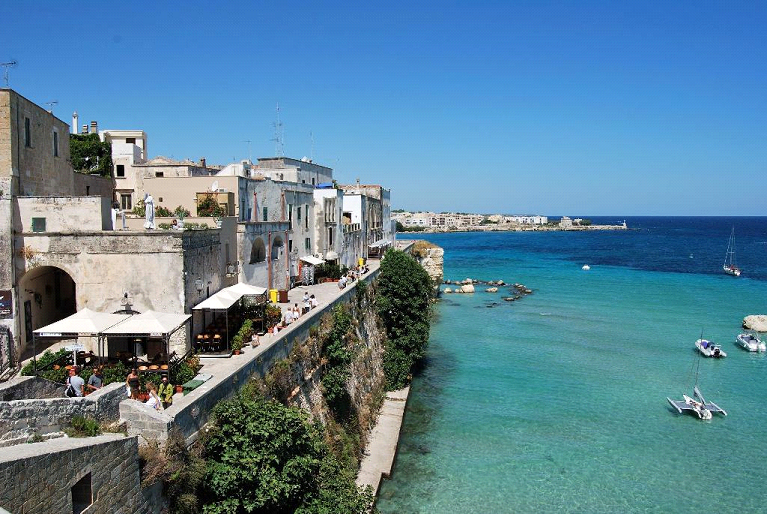 After passing the Alimini Lakes (Alimini Grande and Alimini Piccolo), on whose coast from the sea side there are several tourist villages, you will enter the ancient and glorious Otranto, once the main center of Salento, which is not surprisingly known today as “Terra d’Otranto”. 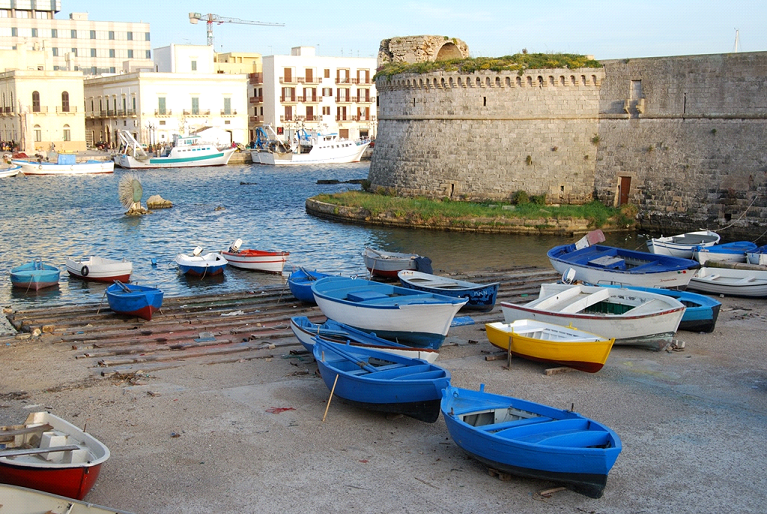 The advice is to stop in Otranto especially in the evening, when the nightlife animates the streets of the small, but enchanting, historic center, between the ramparts and the castle in the upper part, up to the low coast. In the upper part there are numerous small shops where you can buy souvenirs, local products and clothing, as well as several pubs and lounge bars. 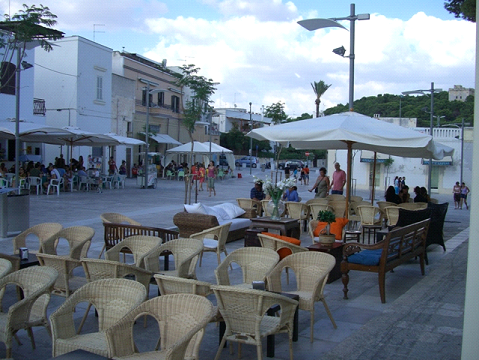 In the low coast near the sea you will find several small places that offer cocktails with music. A charming atmosphere that will stay in it forever. Roca Vecchia, on the other hand, is especially important for its historical and archaeological contribution to the Salento area. Here, in fact, were found a series of human settlements of various ages, from the Bronze Age to the Middle Ages, and it is possible to visit the archaeological area with some medieval and even more ancient remains of the Messapian period. Torre dell’Orso is, on the contrary, a more youthful destination, with a half-kilometer long coastline protected by high rocks. The boys storm these beaches dividing between those who prefer private shores (renowned “The Orsetta”) and others that are spread in the vast, but crowded, free beaches. We descend again to find ourselves in Santa Cesarea Terme. This town presents itself with a certain aesthetic appeal. It was a holiday destination, in fact, already at the beginning of the twentieth century by several noble families, who had built sumptuous villas of which today it is possible to admire several. The best known is undoubtedly Villa Raffaella, today a receptive structure. Here there are no beaches, but seeing the sea on the other hand breaking against the rocks is a guaranteed sight. In addition, you can regenerate yourself in the Baths, also located in a historic building, but equipped with the most modern facilities. The thermal waters are born from the presence of four underground caves from which flow for millennia, their presence was already known during the sixteenth century, then they were abandoned and were exploited only since the early twentieth century. In the immediate vicinity of Santa Cesarea Terme lies Castro, today a tiny village, but once a center much more populated enough to deserve the episcopal seat some centuries ago. Castro offers in the upper part (Castro Superiore) great architectural works such as the sixteenth century Castle and the XII century Cathedral. In the lower part (Castro Marina), a beautiful marina. There are no beaches and the sea water is several meters high, so the destination is not suitable for children. We continue south along the Adriatic coast and the first destination of interest is the bay of Porto Badisco. The inhabited center is tiny and negligible, while the beauty is all in the fabulous inlet of an intense blue sea that stretches between two long tongues of land. There is a small beach in the innermost part of the inlet, the rest is dominated by rocks and nature, which you can admire on your right and on your left taking a bath. 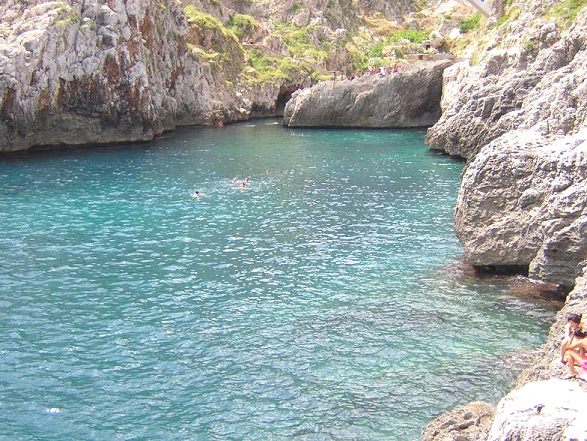 And, if you have a little breath and resistance, swim to the various ravines that open below the rocks. 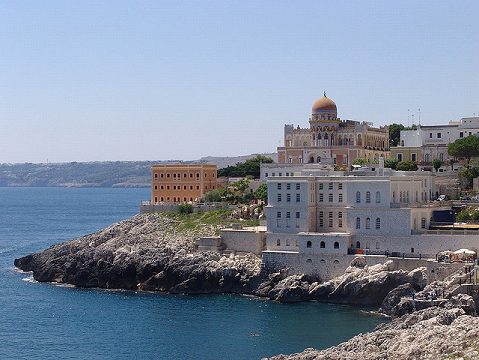 The coast and the thermal baths of Santa Cesarea Terme. In the extreme south of Salento before arriving at Leuca, you will come across the very special Ponte Ciolo, built to pass the coastal road over another inlet like that of Porto Badisco, but this time less deep and with considerably higher rocks. The place has an undeniable attraction for the beauty of the place. You will find a small pebble beach in summer, almost always exhausted, and you can easily access the clear sea. Then there are the dives that several daring people make every summer by jumping into the sea directly from the bridge (about thirty meters in height) or from the nearby rocks. In the immediate vicinity, you will find a panoramic bar and a disco pub with a restaurant, ideal especially for spending a romantic evening with your partner. 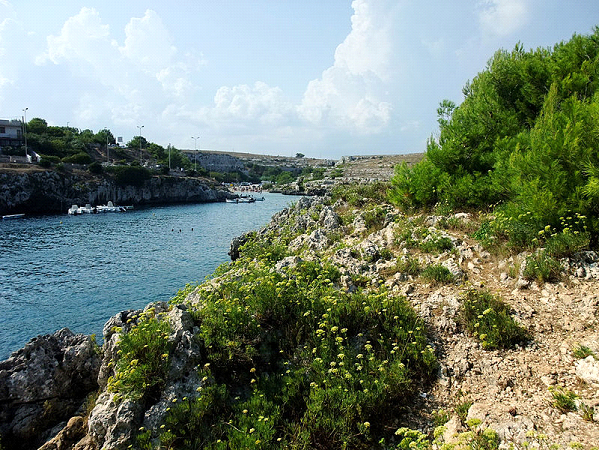 Finally, we reach the southernmost point arriving at Capo Santa Maria di Leuca, also known as De finibus terrae, precisely because it is the extreme strip of land of this part of Italy. Many believe that the Ionian Sea and the Adriatic Sea meet here, while in reality, according to official nautical maps, the meeting point between the two seas is at Punta Palascia near Otranto. To Leuca to see is above all the Sanctuary of Santa Maria di Leuca and the long stairway that leads to the fountain of the Aqueduct. The Sanctuary is located in a prominent position on top of a hill dominating the surrounding area, while if you are really lucky you can see the Monumental Waterfall of the Aqueduct, which flows for 120 meters just below the Sanctuary to flow into the sea, developing between the stairways. The waterfall is almost always closed and was wanted to celebrate the end of the works for the aqueduct in 1939. We go up the coast from Leuca, this time to the west, along the side of the Ionian Sea. In the southern zone the first known center for tourism that we meet is Pescoluse. The small village in the summer becomes much larger thanks to the massive presence of tourists who choose the enchanting beauty of its sea and its beaches, so much so that it has earned over time the nickname of “Maldives of Salento”, by extension of the name of a private beach. Moreover, here there are long beaches of fine white sand that stretch for about six kilometers and a transparent sea with blue and celestial hues reminiscent of the beautiful islands of the Indian Ocean. In addition to private beaches you will find some stretches with free beaches and other free beaches, where you pay only for services. The coast and the Tower a Torre San Giovanni. A little further north rises Torre San Giovanni, the diamond point of the Ugentine Riviera. The goal is to be among the most popular among young people thanks to a very active evening life, especially in the stretch of the waterfront of Corso Annibale. The pro loco of Ugento and the private beaches, then, organize daily events, evenings or shows that allow tourists to never get bored. 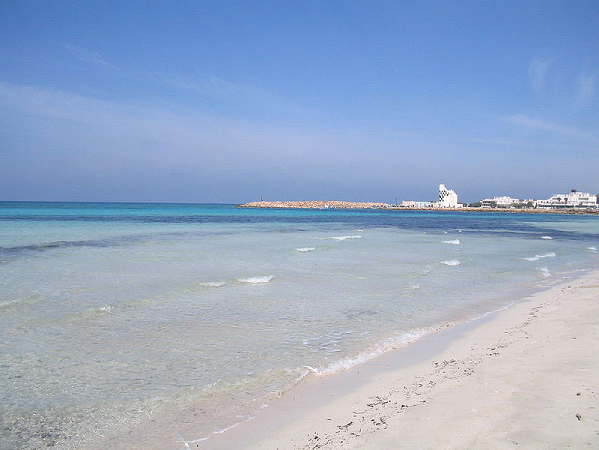 At Torre San Giovanni you will find both a long stretch of low cliff on one side and a sandy stretch on the other. The square of Santa Caterina. Santa Caterina, on the other hand, has a coast made exclusively of low cliffs, but the beauty of the water deserves a lot and it is no coincidence that many decide to also reach Santa Caterina for a refreshing dip. This small town is also very active during the evenings and summer nights, thanks to the presence of a large pedestrian area where there are many young people who stroll among places with outdoor spaces and gazebos, ice cream parlors, caterers, restaurants and pubs. Isola dei Conigli in Porto Cesareo. To the north of Gallipoli, to be visited are certainly Santa Maria al Bagno and Santa Caterina, marine of the Riviera di Nardò. Santa Maria al Bagno presents a small but suggestive sandy inlet between rocks, always taken by storm every summer and prohibitive at weekends. It is known above all for the evocative structure of “Le Quattro Colonne”, an ancient 16th century watchtower whose roof has collapsed, leaving today only the four corners of it, showing the name of “Quattro Colonne”. Today they host a restaurant, have been made safe and offer particular charm even in the evening, well lit. The bay of Porto Selvaggio. 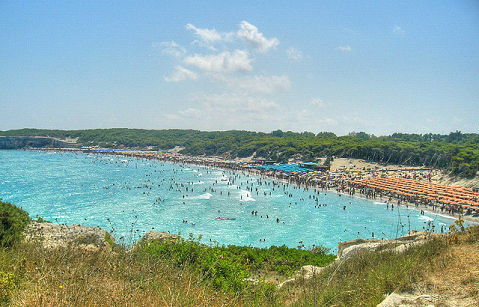 Not far further north, a puntatina is to be done during the daytime at Porto Selvaggio. The town is not a town, but it is a beautiful stretch of coastline that you can reach only after a path on a path of over a kilometer within a wooded area. The effort will be rewarded by a beautiful sea along low rocks that offer a show without equal. The sea here is relatively cold due to a spring that gushes near one of the rocks, there is a real beach, but a pebble beach. The water is crystal clear as ever and you can take a dip from the rocks or with a little ‘swimming strokes to reach ravines of rare beauty. The inlet is protected immediately behind by a large pine forest where you can find shade in the warm hours, equipped with toilets and a small kiosk where you can get something to drink or eat. Recommendation of obligation: always take it all away and do not soil this corner of Earthly Paradise!